Habib al-Malki praises recent Turkish advancements in the development sector. 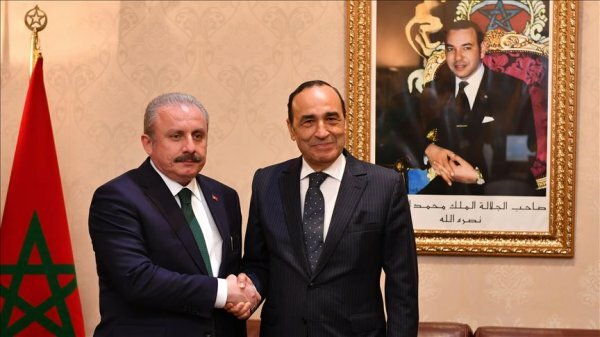 Turkish Parliament Speaker Mustafa Şentop on Wednesday met his Moroccan counterpart, Habib al-Malki, to discuss means of enhancing cooperation between the two countries. The meeting took place on the sidelines of the 14th session of the Parliamentary Union of Organization of Islamic Cooperation (OIC) member-states. After the meeting, al-Malki praised Turkish advancements in the development sector, several concrete examples of which he saw during a recent visit to the country. Wednesday’s talks, he added, had tackled means of further enhancing bilateral cooperation, especially in the field of parliamentary affairs. Sentop arrived in Morocco on Monday for a two-day visit, during which he met several Moroccan officials.